Over the recent years, live cell-based assays have been used successfully to detect antibodies against surface and conformational antigens. Here, we describe a method using high-throughput flow cytometry enabling the analysis of large cohorts of patients. Detection of novel antibodies will improve diagnosis and treatment of immune-mediated disorders. Amatoury, M., Merheb, V., Langer, J., Wang, X. M., Dale, R. C., Brilot, F. High-throughput Flow Cytometry Cell-based Assay to Detect Antibodies to N-Methyl-D-aspartate Receptor or Dopamine-2 Receptor in Human Serum. J. Vis. Exp. (81), e50935, doi:10.3791/50935 (2013). Over the recent years, antibodies against surface and conformational proteins involved in neurotransmission have been detected in autoimmune CNS diseases in children and adults. These antibodies have been used to guide diagnosis and treatment. Cell-based assays have improved the detection of antibodies in patient serum. They are based on the surface expression of brain antigens on eukaryotic cells, which are then incubated with diluted patient sera followed by fluorochrome-conjugated secondary antibodies. After washing, secondary antibody binding is then analyzed by flow cytometry. Our group has developed a high-throughput flow cytometry live cell-based assay to reliably detect antibodies against specific neurotransmitter receptors. This flow cytometry method is straight forward, quantitative, efficient, and the use of a high-throughput sampler system allows for large patient cohorts to be easily assayed in a short space of time. Additionally, this cell-based assay can be easily adapted to detect antibodies to many different antigenic targets, both from the central nervous system and periphery. Discovering additional novel antibody biomarkers will enable prompt and accurate diagnosis and improve treatment of immune-mediated disorders. Over recent years, autoimmune forms of central nervous system (CNS) diseases have been identified. It has been shown that these diseases are associated and defined by the presence of autoantibodies. These antibodies bind to neuronal receptors or synaptic proteins involved in neurotransmission1,2. Different antigens have been detected, such as N-methyl-D-aspartate receptor (NMDAR)3-5, γ-aminobutyric acid B receptor (GABAB) receptor6, α-amino-3-hydroxy-5-methyl-4-isoxazolepropionic acid (AMPA) receptor7, voltage-gated potassium channel (VGKC) associated proteins: leucine-rich glioma-activated 1 protein (LGL-1) and contactin-associated protein 2 (capsr2)8,9, glutamate receptor5,10, and dopamine-2 receptor (D2R)11. In the past, these autoimmune CNS disorders (mainly called encephalitis) were often undiagnosed and untreated. These novel antibody biomarkers, e.g. NMDAR antibody or D2R antibody, have substantially improved diagnosis and awareness, and have opened treatment options for patients. Indeed, early treatment with immunotherapies is associated with improved outcome11,12. Traditional methods to detect antibodies, such as enzyme-linked immunosorbent assay (ELISA) and western blot have been used for detection of antibodies in sera. However, they do not readily enable recognition of extracellular or surface epitopes and, rather, may reveal immunoreactivity towards an intracellular epitope. Furthermore, antibodies that bind to the extracellular domain of important proteins involved in neurotransmission are likely to be pathogenic2,3,7,13,14. Therefore, the development of accurate and sensitive assays to discover relevant cell surface or extracellular antibody targets in patients is paramount. The gold standard method in the field is based on the use of live cells, in so-called “cell-based assays”. This method involves the expression of an antigen at the surface of mammalian cells (most often human embryonic kidney 293 (HEK293) cells) in its native form by transfection of vectors containing the complete cDNA sequence of the antigen of interest. Live nonpermeabilized cells are then incubated with diluted patient serum and followed by fluorochrome-conjugated anti-human immunoglobulin (Ig) secondary antibody. The intensity or level of fluorescence is then detected and is associated to the level of autoantibody binding. This technique is specific, as only one antigen is overexpressed in cells. The most widely used “read-out” has been confocal microscopy analysis after immunocytochemistry4,5,8-10. However, flow cytometry cell-based assays have been successfully used to detect antibodies in patients with demyelinating diseases15-17. In particular, Waters et al.15 compared the detection of antibody using a panel of antibody detection techniques including cell-based assays followed by microscopy or flow cytometry analyses, and has shown flow cytometry cell-based assay to be the most sensitive, accurate, and reliable method. Therefore, flow cytometry cell-based assay is advantageous as it is quantitative, not investigator-dependent, and does not involve any use of radioactive material. It is also convenient as it allows large patient cohorts to be assayed in a short amount of time. More recently, we have optimized a high-throughput flow cytometry cell-based assay to detect NMDAR antibody and D2R antibody in patients with autoimmune CNS diseases11. Our group recently detected NMDAR antibody in patient sera using flow cytometry cell-based assay. These NMDAR antibody-positive sera were previously analyzed using confocal microscopy and were also found to be positive11. This protocol outlines a flow cytometry cell-based assay for the detection of conformation-sensitive CNS antibody in patient serum utilizing an automated high-throughput sampler. Obtain full-length cDNA clone of human D2R or NMDAR subunit 1 (NR1). Choose an expression vector, such as pIRES2-EGFP, which is suitable for expression of transmembrane proteins with an enhanced green fluorescent protein (GFP) reporter under control of an internal ribosome entry site (IRES), enabling both antigens and GFP to be coexpressed in cells separately. Subclone human cDNA within pIRES2-EGFP vector. To subclone cDNA, use appropriate restriction enzymes (for example NheI and XhoI for human D2R cDNA). Ligate cut cDNA insert within restricted pIRES2-EGFP vector. Sequence ligated pIRES2-EGFP D2R or NMDAR vector to check whether the vector contains the correct sequence. Purify and amplify pIRES2-EGFP D2R or NMDAR vector for later use in transfection. Culture HEK293 cells in tissue culture flasks with fresh Dulbecco’s Modified Eagle Medium (1x) (DMEM) complete with 4.5 g/L D-glucose, L-glutamine and 110 mg/L sodium pyruvate supplemented with 10% fetal bovine serum (FBS), 2 mM GlutaMAX, and 50 μg/ml Gentamicin. Detach HEK293 cells using trypsin and transfer to a conical tube. Wash by centrifuging cells at 250 x g for 6 min and resuspend the cell pellet in fresh complete DMEM. Count the cells and seed 6 well plates at around 8 x 105 cells/well and culture overnight in 2ml DMEM at 37 °C and 5% CO2 in an incubator. Once they have reached around 70% confluency, transfect the HEK293 cells with pIRES2-EGFP NR1 (HEK293NMDAR+ cells), pIRES2-EGFP D2R (HEK293D2R+ cells), and pIRES2-EGFP (HEK293CTL cells; vector control) as follows. Keep some untransfected HEK293 cells for compensation later on. Prepare the required volume of transfection mix comprising 2.5 μg DNA, 200 μl 0.9% sodium chloride and 4 μg/ml polyethylenimine/well (each containing 2 ml fresh complete DMEM). Immediately vortex the mix for 10 sec and incubate at room temperature (RT) for 10 min, before adding volume of transfection mix to the appropriate wells. Cover the plate, wrap the sides with Parafilm, and centrifuge at 280 x g for 5 min to aid cell transfection. Remove the Parafilm and then place in the incubator to culture at 37 °C. Replace culture media 18 hr later with fresh complete DMEM, and maintain in culture for another 72 hr. Optional: 72 hr post-transfection, transfected cells can be selected by culture in complete DMEM supplemented with 250 μg/ml Geneticin, in order to obtain a polyclonal stable transfectant. Detach HEK293NMDAR+, HEK293D2R+, and HEK293CTL cells by incubation with 500 μl/well Versene for approximately 5 min at 37 °C. Resuspend in 2ml/well of PBS (-Ca2+/-Mg2+) supplemented with 2% FBS (PBS/FBS) and transfer to a 15 ml or 50 ml conical tube. Wash cells by centrifuging at 250 x g for 6 min and resuspend the cell pellet in 15-50 ml PBS/FBS. Repeat wash 2x. Count the cells and then resuspend in PBS/FBS at 1 x 106 cells/ml. Design the 96-well template for flow cytometry acquisition, considering that HEK293D2R+ or HEK293NMDAR+ cells, as well as HEK293CTL cells will have to be incubated with each patient sample or primary antibody. Seed cells in a V-bottom 96-well plate at 50,000 cells/well according to the flow cytometry acquisition template. Pellet the cells by centrifuging the 96-well plate at 450 x g for 5 min and gently remove the supernatant using an electronic or manual multichannel pipette, tilting the plate on an angle and taking care not to aspirate the cell pellet. Serial dilutions of primary antibody in order to assess antigen surface expression. Patient samples in order to detect antibody. Use appropriate flow cytometry compensation controls, e.g. unstained untransfected HEK293 cells, GFP+ HEK293 cells (AF647-), and untransfected AF647+ HEK293 cells (GFP). Wash cells by centrifuging at 450 x g for 5 min and resuspend the cell pellet in 170 μl PBS/FBS. Repeat wash step two more times. Incubate cells for 1 hr at RT in the dark with 1:100 dilution of AF647-conjugated secondary antibody (anti-human IgG for patient serum and anti-mouse IgG for anti-NR1 or anti-D2R primary antibodies). Wash the cells three times, as in step 3.7, and resuspend in 35 μl PBS/FBS for flow cytometry cell acquisition. Set up the high-throughput sampler (HTS) on the flow cytometer (BDLSRII). Acquire 10,000 events/well according to the flow cytometry acquisition template. First, gate the live HEK293 cells based on forward (size) and side (granularity) scatters. Further gate live HEK293 cells based on high GFP-positivity to analyse only the transfected cells. Determine the mean fluorescence intensity (MFI) of the AF647 channel within the live GFP-positive cells. Plot concentrations of primary antibody (anti-NMDAR or anti-D2R antibody) versus the MFI obtained from the cells incubated with these antibodies. For each patient and control sample, determine the ΔMFI by subtracting the MFI of the HEK293CTL cells from the MFI of the HEK293D2R+ or HEK293NMDAR+ cells, respectively. Calculate the threshold of antibody positivity by adding three standard deviations above the mean ΔMFI of the control cohort. Plot individual samples grouped according to their serum type on a graph and represent the threshold as a line. Live HEK293D2R+ and HEK293CTL cells were acquired at the flow cytometer using a high-throughput sampler. During analysis, cells were gated based on forward scatter (size) and side scatter (granularity) parameters (Figures 1A and 1D). Transfected HEK293 cells expressed the reporter molecule, GFP, in the cytoplasm, and untransfected cells were excluded from analysis (Figures 1B and 1E). Within the GFP+ gate, the MFI associated with AF647-conjugated anti-human IgG secondary antibody binding was measured (Figures 1C and 1F). In order to eliminate the background fluorescence when analyzing human sera, the ΔMFI was calculated by subtracting the MFI of the HEK293CTL cells from the MFI of the HEK293D2R+ cells (Figure 1G). Data shown is representative of D2R antibody analysis, and the same gating strategy and data analysis can be used for NMDAR antibody detection (data not shown). Antibody detection by flow cytometry cell-based assay is based on the cell surface expression of the antigen of interest. As shown in Figure 2, HEK293NMDAR+ cells highly expressed surface NMDAR (Figure 2A) and HEK293D2R+ cells highly expressed surface D2R (Figure 2B), whereas HEK293CTL cells expressed neither of these antigens (Figures 2A and 2B). The patient groups used in this work consisted of a patient cohort with NMDAR encephalitis (NMDAR Enc, n = 4, an encephalitis defined by the detection of surface NMDAR-subunit 1 NR1- antibody3), D2R antibody-associated encephalitis (D2R Enc, n = 6, an encephalitis defined by the detection of surface D2R antibody11), and a control cohort with other noninflammatory neurological diseases (OND, n = 26), such as epilepsy, stroke, and developmental or neurodegenerative disorders. Patient samples have been previously validated for NMDAR5 and D2R11 IgG positivity. The four patients positive for NMDAR antibodies had a typical clinical syndrome of NMDAR encephalitis as described3 and serum samples were proven positive using cell-based assays for NMDAR antibodies as described and available in commercial use3,4. The six patients positive for D2R antibodies had a typical clinical syndrome of basal ganglia encephalitis as described11, and serum samples were proven positive for D2R antibodies using D2R knock-out brain sections, transfected cells, and neurons11. In order to determine antibody positivity in patients, the threshold, or cutoff, of antibody positivity was calculated in each experiment by adding three standard deviations above the mean ΔMFI of the OND controls. The 4/4 patients with NMDAR Enc were confirmed positive for human surface NMDAR IgG antibody (Figure 3A), whereas the 6/6 patients with D2R Enc were positive for human surface D2R IgG antibody (Figure 3B). None of the positive patients were double positive for antibodies targeting NMDAR and D2R. NMDAR and D2R antibodies were not detected in any of the OND controls analyzed (Figures 3A and 3B). Patient samples were considered positive if they were above the threshold in at least two out of three repeated experiments. Figure 1. Detection of antibody by high-throughput flow cytometry cell-based assay: gating strategy and data analysis. 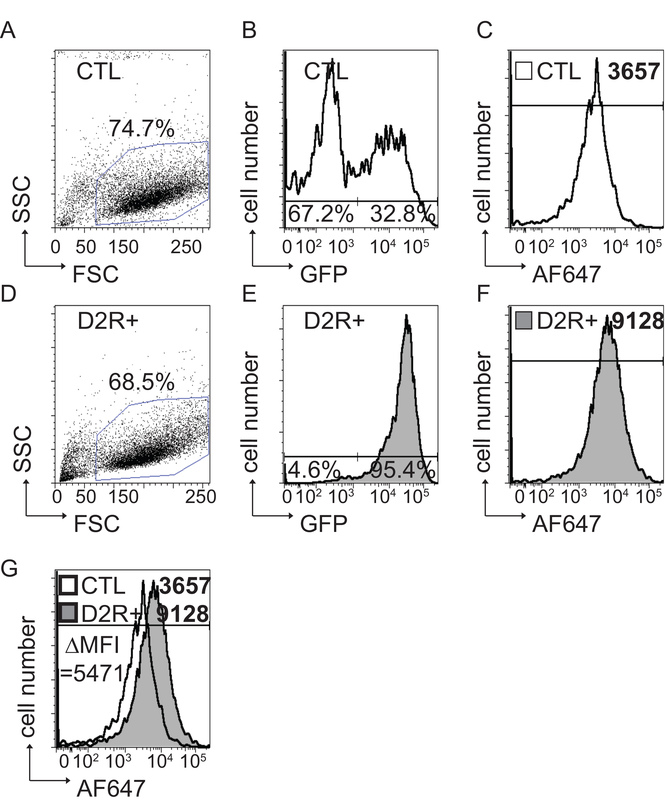 Live HEK293CTL cells and HEK293D2R+ stable transfectants were gated based on forward scatter (FSC) and side scatter (SSC) (74.7% and 68.5%, respectively; A,D). GFP positive cells within HEK293CTL and HEK293D2R+ cells (32.8% and 95.4%, respectively; B,E) were further gated to exclude untransfected GFP- cells (67.2% and 4.6%, respectively; B,E). Within the GFP+ cells, the mean fluorescence intensity (MFI) associated with AF647-conjugated anti-human IgG secondary antibody (HEK293CTL = 3,657; HEK293D2R+ = 9,128) was measured (C,F). For human samples, the ΔMFI was calculated by subtracting the MFI of the HEK293CTL cells from that of the HEK293D2R+ cells (G). Representative data of D2R antibody detection is shown. Click here to view larger image. Figure 2. Expression of surface NMDAR and D2R determined by high-throughput flow cytometry cell-based assay. HEK293NMDAR+ (A), HEK293D2R+ (B), and HEK293CTL cells were stained with serial dilutions of primary antibody, followed by appropriate secondary antibody. High surface expression of NMDAR and D2R were observed. MFI values correlated with antibody titre as they increased steadily with increasing concentrations of primary antibody. As expected, there was no detection of surface NMDAR or D2R in HEK293CTL cells. Representative data is shown. Click here to view larger image. Figure 3. Confirmed detection of surface NMDAR and D2R antibodies in a cohort of patients. Sera from NMDAR encephalitis (NMDAR Enc, n = 4), D2R antibody-associated encephalitis (D2R Enc, n = 6) patients, or controls with other neurological diseases (OND, n = 26 or 24) were incubated with live HEK293NMDAR+, HEK293D2R+, and HEK293CTL cells, followed by AF647-conjugated anti-human IgG secondary antibody. Surface NMDAR and D2R antibodies were detected in the serum of 4/4 NMDAR Enc patients (A) and 6/6 D2R Enc patients (B), respectively, whereas none of the OND controls (0/26 or 0/24) had either antibody (A, B). Dotted lines on graphs represent the positivity threshold calculated by adding three standard deviations to the mean ΔMFI of OND controls. Representative dot plots out of three experiments are shown. Click here to view larger image. This paper describes a novel application of flow cytometry live cell-based assay to detect antibodies targeting specific cell surface neuronal proteins using a high-throughput sampler. Using this technique, we report that a subgroup of patients affected with autoimmune CNS diseases have serum antibodies to surface NMDAR or to surface D2R. Essential steps for optimal antibody detection using this high-throughput flow cytometry live cell-based assay include 1) obtaining a high yield of healthy transfected cells, 2) verifying high cell surface expression of the antigen of interest, 3) establishing a threshold of antibody positivity using a cohort of controls, 4) and confirming the reproducibility of the data. 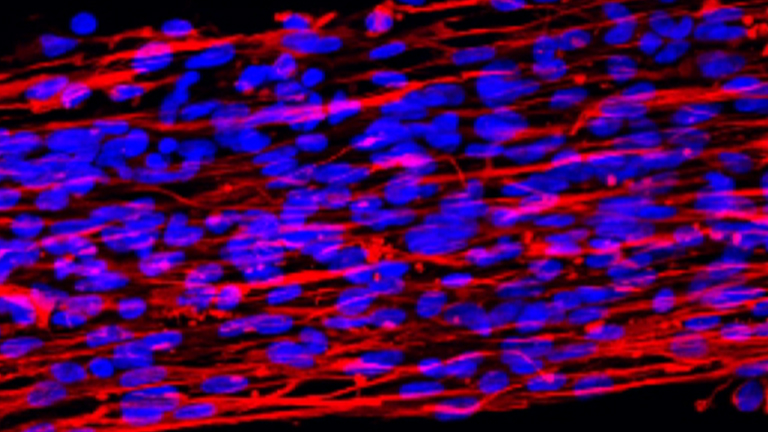 The culture of healthy cells is fundamental to the success of this technique. HEK293 cells are well-known for their ease of culture, high transfection efficiency, and their lack of expression of neuronal proteins, which is why they have been commonly used in cell-based assays to detect antibody to specific neuronal antigens4,5,8-10. An optimal transfection rate to acquire a high percentage of live GFP+ cells is critical for this assay to accurately calculate MFI. For this reason, producing a polyclonal stable cell line of GFP+ HEK293NMDAR+, HEK293D2R+, or HEK293CTL cells is advantageous as it provides a consistent high level of GFP+ cells, with the added convenience of not having to repeatedly transfect cells prior to each experiment. A quick viewing of the transfected cells through an inverted microscope is recommended to check for healthy cells (GFP+ cells will fluoresce if mercury lamp is available). If viability seems not so high, it may be beneficial to use a viability dye, such as 7-amino-actinomycin D, before cell acquisition at the flow cytometer and to add an extra gating step in the analysis to exclude nonviable cells. In autoimmune CNS diseases, antibodies that bind to extracellular domains of brain antigens are thought to be pathogenic2,3,7,13,14, therefore emphasis is placed on the detection of antibodies using live and nonpermeabilized cells. This protocol achieves this aim by using transfected cells expressing surface antigens. Therefore, the correct export of these antigens to the surface needs to be determined by the staining of transfected cells with serial dilutions of a commercial primary antibody against the antigen of interest. When assessing the level of expression of surface antigen on nonpermeabilized cells, it is essential to use an antibody targeting an extracellular epitope of the protein. If a specific antibody is not available, it may be necessary to add a tag on an extracellular domain of the antigen, and thereafter use a commercial antibody against the tag to determine surface expression. We have successfully used this approach using a hemagglutinin-tagged D2R and ruled out immunoreactivity of patient sera to the tag itself11. It is also critical that the entire cDNA sequence of the antigen of interest is subcloned into a suitable vector so that expression and structural integrity at the cell membrane is not compromised. Indeed, it has been previously shown that particular domains of a receptor protein are essential for the correct folding, export, and integration into the cell membrane18. In flow cytometry cell-based assays, assessing antibody positivity of patient sera in each experiment relies on the establishment of a threshold, or cutoff, derived from a cohort of controls. Zhou et al.19 calculated a threshold of antibody positivity by adding two standard deviations above the mean Δmedian fluorescence intensity, and this approximately corresponded to the 95th percentile of the healthy control range. In our previous studies, we opted for a higher cutoff (addition of three standard deviations to the mean ΔMFI of the control cohort), which corresponded to the 99th percentile of the healthy control range11,20. In addition, McLaughlin et al.16 chose to express the measurement of specific antibody reactivity as the ratio of MFI between the antigen-expressing cells and the antigen-negative cells. A ratio of greater than 5 was considered positive and corresponded to three standard deviations above mean ratio of controls, which is similar to our work. Using a higher threshold increases the stringency of the protocol and improves the discrimination between controls and patients positive for antibodies. Importantly, in our experience, the antibody reactivity of the healthy control range was not significantly different than the OND range, enabling the use of either population to calculate the threshold of antibody positivity11,20. As in all research experiments, data reproducibility is paramount. Patient sera are considered positive for antibody against a specific neuronal antigen if they are above the threshold of positivity in at least two out of three independent experiments. Individual patients have varying concentrations of IgG in their serum. These variations may have an influence on the level of antibody binding, relative to other patients. All patient sera used in our previous study were measured by nephelometry and found to be within the normal range (6.2-14.4 g/L)11, and we always diluted sera with the same dilution factor. Establishing a titer curve of individual serum might be beneficial in order to compare concentrations of antibodies between patients. Additionally, initial blinding of the investigator is recommended during cell-based assay, but controls need to be unblinded in order to calculate the positivity threshold. When a plausible antibody target is found, appropriate validation is required to prevent false positivity. Antibody-positive or -negative samples detected using the flow cytometry cell-based assay should be assayed using an alternate methodology that would preferentially not utilize denatured or linearized antigens. For example, decreased immunoreactivity on brain sections from antigen-specific knock-out animals has been successfully shown in the case of several newly-reported CNS autoantigens9-11,21. Immunoabsorption of patient sera on antigen-expressing cells also have been used to validate results9,11. The flow cytometry cell-based assay protocol described in this paper can be easily altered to assess antibody specificity to a multitude of different antigenic targets, including those found outside the CNS. It is likely that antibodies of other unknown specificities exist and are yet to be identified. Furthermore, this technique is suitable for detecting different classes and subclasses of Ig, including IgM, as shown in our previous studies11,20. The determination of IgG subclass may also reveal potential for contributing to disease pathogenesis. For example IgG1 or IgG3 are able to mediate antibody-dependent cell-mediated cytotoxicity or complement-dependent cytotoxicity, which are reported autoantibody-induced pathogenicity mechanisms14,20,22. Fluorescent dyes other than AF647 (far red) may also be utilized as long as they have emission peaks far enough from that of the reporter molecule, GFP. Any overlapping emission spectra must have the correct compensation requirements. Determining the specificity of an antibody to an intracellular protein would also be possible using flow cytometry, although, cells first need to be fixed and permeabilized to make the antigen available to antibody binding. This alternative technique can result in high background due to the exposure of antibodies to intracellular domains as well as numerous cellular antigens, which were otherwise hidden in live nonpermeabilized cells. These confounding factors may reduce the strength of the flow cytometry cell-based assay and suitable controls must be performed accordingly. The use of high-throughput flow cytometry cell-based assay provides a reliable and accurate method for the detection of antibodies in human serum from large cohorts of patients. Discovering additional novel antibodies through this technique will help diagnosis and future treatments of patients with autoimmune CNS diseases. Conflict of interest: A patent has been filed by F.B. and R.C.D. (University of Sydney) claiming D2R as target for autoantibodies. This work was supported by the Australian National Health and Medical Research Council, Star Scientific Foundation (Australia), Tourette syndrome Association (USA), The Trish Multiple sclerosis Research Foundation and Multiple Sclerosis Research Australia, Petre Foundation (Australia), the Rebecca L. Cooper Medical Research Foundation (Australia). We thank all the patients and family members who provided samples for our study. Lancaster, E., Martinez-Hernandez, E., Dalmau, J. Encephalitis and antibodies to synaptic and neuronal cell surface proteins. Neurol. 77, 179-189 (2011). Vincent, A., Bien, C. G., Irani, S. R., Waters, P. Autoantibodies associated with diseases of the CNS: new developments and future challenges. Lancet Neurol. 10, 759-772 (2011). Dalmau, J., et al. Anti-NMDA-receptor encephalitis: case series and analysis of the effects of antibodies. Lancet Neurol. 7, 1091-1098 (2008). Dalmau, J., et al. Paraneoplastic anti-N-methyl-D-aspartate receptor encephalitis associated with ovarian teratoma. Ann Neurol. 61, 25-36 (2007). Dale, R. C., et al. N-methyl-D-aspartate receptor antibodies in pediatric dyskinetic encephalitis lethargica. Ann Neurol. 66, 704-709 (2009). Lancaster, E., et al. Antibodies to the GABA(B) receptor in limbic encephalitis with seizures: Case series and characterisation of the antigen. Lancet Neurol. 9, 67-76 (2010). Lai, M., et al. AMPA receptor antibodies in limbic encephalitis alter synaptic receptor location. Ann Neurol. 65, 424-434 (2009). Irani, S. R., et al. Antibodies to Kv1 potassium channel-complex proteins leucine-rich, glioma inactivated 1 protein and contactin-associated protein-2 in limbic encephalitis, Morvan’s syndrome and acquired neuromyotonia. Brain. 133, 2734-2748 (2010). Lai, M., et al. Investigation of LGI1 as the antigen in limbic encephalitis previously attributed to potassium channels: a case series. Lancet Neurol. 9, 776-785 (2010). Lancaster, E., et al. Antibodies to metabotropic glutamate receptor 5 in the Ophelia syndrome. Neurol. 77, 1698-1701 (2011). Dale, R. C., et al. Antibodies to surface dopamine-2 receptor in autoimmune movement and psychiatric disorders. Brain. (2012). Titulaer, M. J., et al. Treatment and prognostic factors for long-term outcome in patients with anti-NMDA receptor encephalitis: an observational cohort study. Lancet Neurol. 12, 157-165 (2013). Hughes, E. G., et al. Cellular and synaptic mechanisms of anti-NMDA receptor encephalitis. J Neurosci. 30, 5866-5875 (2010). Bien, C. G., et al. Immunopathology of autoantibody-associated encephalitides: clues for pathogenesis. Brain. 135, 1622-1638 (2012). Waters, P. J., et al. Serologic diagnosis of NMO: a multicenter comparison of aquaporin-4-IgG assays. Neurol. 78, 665-671 (2012). McLaughlin, K. A., et al. Age-Dependent B Cell Autoimmunity to a Myelin Surface Antigen in Pediatric Multiple Sclerosis. J Immunol. 183, 4067-4076 (2009). Probstel, A. K., et al. Antibodies to MOG are transient in childhood acute disseminated encephalomyelitis. Neurol. 77, 580-588 (2011). Cho, D., et al. N-terminal Region of Dopamine D2 Receptor, a Rhodopsin Family GPCR, Regulates Proper Integration into Plasma Membrane and Endocytic Routes. British journal of pharmacology. (2011). Zhou, D., et al. Identification of a pathogenic antibody response to native myelin oligodendrocyte glycoprotein in multiple sclerosis. Proceedings of the National Academy of Sciences of the United States of America. 103, 19057-19062 (2006). Brilot, F., et al. Antibodies to native myelin oligodendrocyte glycoprotein in children with inflammatory demyelinating central nervous system disease. Ann Neurol. 66, 833-842 (2009). Boronat, A., et al. Encephalitis and Antibodies to Dipeptidyl-Peptidase-Like Protein-6, a Subunit of Kv4.2. Potassium Channels. Ann Neurol. 73, 120-128 (2013). Hinson, S. R., et al. Aquaporin-4-binding autoantibodies in patients with neuromyelitis optica impair glutamate transport by down-regulating EAAT2. J. Exp. Med. 205, 2473-2481 (2008).